At this time of year, it may be hard to remember that there is more to Salem than the costumed crowds and traffic tangles. The city is, in fact, a terrific destination for food lovers of all sorts. From upscale dining to hole-in-the-wall take out, candy shops, bakeries, funky bars, and ethnic eateries, this historic seaport has it all. And if you are looking for someone to help navigate you through Salem’s wonderful world of food, there’s no one better than Karen Scalia. Charming, fun, and incredibly knowledgeable, she is a delight. Combining her skills as a Salem tour guide with her background in event planning and passion for food, Scalia created Salem Food Tours, which launched in September. We were lucky enough to tag along on a tour last week and right off the bat were impressed with the careful thought and organization that goes into creating each tour. With an initial email of helpful instructions, a warm welcome as though you are an old friend, and a well-planned sequence of tastings, Scalia has put together a memorable experience for tourists and locals alike. With many shops and restaurants as partners, each tour varies, depending on what is going on that day. 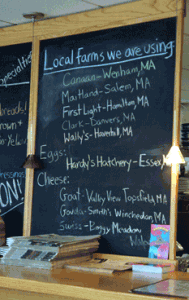 Thursday tours can include the Salem Farmer’s Market, and vegan tours are available. Scalia will even create a private tour for your special event. Our tour started off with a bit of Salem history as we headed into Salem Spice/The Picklepot, where the enthusiastic David Bowie (no, not that one) gave us a crash course in Salem’s spice trade and the history of salt and pepper. We compared four peppers and seven salts, and while we enjoyed the pink peppercorns, the Pacific Smoked Sea Salt had us swooning. The next stop was Scratch Kitchen where Chef Bill Fogarty took time out from the busy lunch crowd to talk to us about his house-smoked meats and locally sourced fare. He treated us to a classic old style New England Clam Chowder with a clean, fresh taste that immediately brought me back to my grandmother’s kitchen. 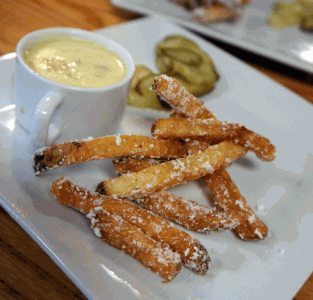 We also sampled incredibly tasty hand-cut, bacon-dusted French fries with house-made ketchup. Yes, I said bacon-dusted. Scratch sells bacon popcorn, too. We popped into Comida for a quick but appealing tasting of rice and beans with a choice of meat and homemade salsa and pickled red onions. 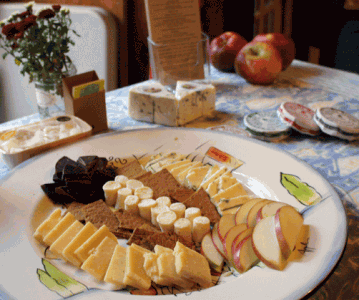 Then it was on to one of our favorite shops, Milk and Honey, to talk cheese and chocolate with Sharon and Bill. Everyone’s favorite seemed to be the Shallot Hannabells from Shy Brothers Farm in Westport—creamy, tart, and savory. And of course Somerville’s Taza Chocolate is always a hit. 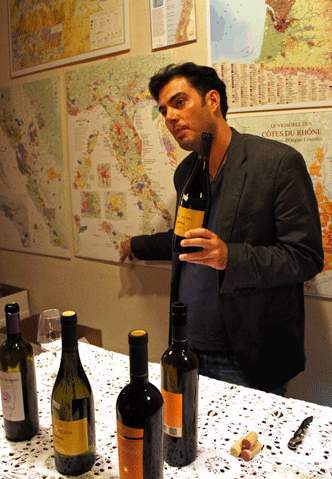 We stepped next door to Salem Wine Imports, where we chatted with owner and wine expert Eric Olsen. (Whether you are a wine neophyte or an experienced oenophile, do yourself a favor and sign up for his email newsletters. Thoughtful prose and lovely photos along with the current sales make them an inbox treat.) Eric handed us over to the very capable Chris, who poured three Italian wines and discussed the region and terroir and possible table wines for the upcoming holiday season. We tore ourselves away with some difficulty but were glad we did when we ended up at Life Alive. A new favorite of the Dish, it was a treat to chat with manager Christina about the workings of the café and the vision behind the food. 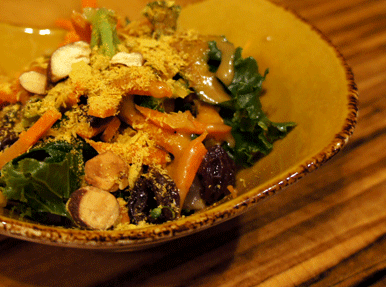 We sampled the Swami bowl with kale, tamari almonds, raisins, carrots, and broccoli, over brown rice with a curry miso sauce that was truly inspired. Top that off with a taste of locally made vegan truffles, and you’re in heaven. You would think by this point we would be too full to either move or eat another bite, but the tour was well paced, and we happily moved on to the finale, at 43 Church. This was a lovely end to the tour. 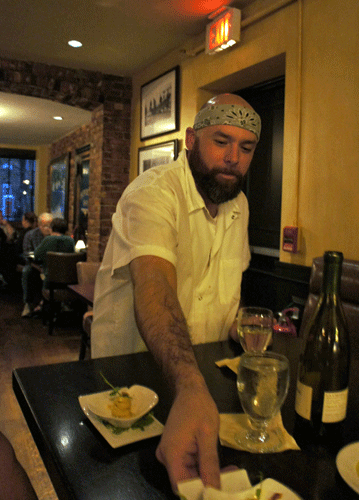 We relaxed at a table in the bar, were offered another wine taste and several fabulous small plates. I have to say that when 43 Church emerged from the Lyceum last year, its upscale surf and turf type menu didn’t really excite us. Since then, Chef Doug Papows has taken over in the kitchen, and if what we tasted during the tour is any indication, his creative vision is worth revisiting this Church Street eatery. The extremely tender lamb osso buco, tucked inside handkerchief pasta (all the pasta is house-made by sous chef Kirk Vanacore) accompanied by roasted grape tomatoes and spinach with a crumble of feta cheese was a savory, mouthwatering combination. But my favorite was a cassoulet, perfect for the autumn weather. The bean stew was rich and velvety, created with a barnyard’s worth of meat for flavor, including braised lamb and pork, boar and pheasant sausages, duck confit and a fried duck tenderloin. Pastry chef Saskia Nugent was on duty that afternoon and mystified us with her dessert. How can a moist dense-looking slice of chocolate cake with satiny frosting and rich raspberry ganache be light as a feather? This decadent enigma was the perfect end to our afternoon of gastronomy. Because every tour varies, your experience won’t match ours exactly, but we can guarantee that Karen Scalia is the gal you want to have show you her town. 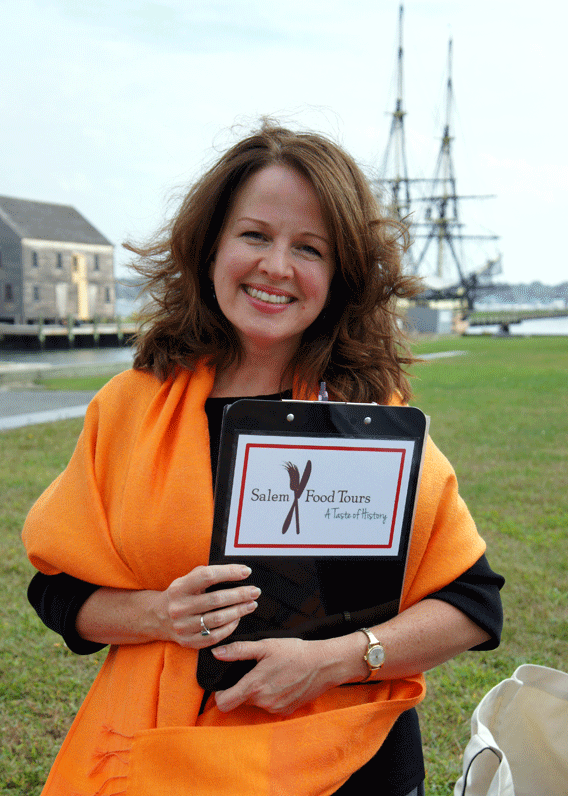 From her infectious smile and attention to detail to her vast expertise on Salem’s history and food, Karen has made Salem Food Tours an experience food fans from near and far will savor. We’re not sure exactly what happened, but our inner carnivores went wild last week at Scratch Kitchen. With house-smoked pulled pork and thick-cut bacon on the menu, it just seemed like the thing to do. 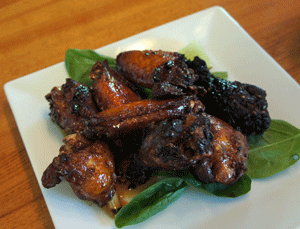 It all started with the house-cured wings, which were smoky, sweet, and crispy ($9). We’re already planning a return trip for more. We had to try the pulled pork sandwich, seeing how it’s a specialty of the house and made from pasture-raised hogs sourced from Northeast Family Farms. 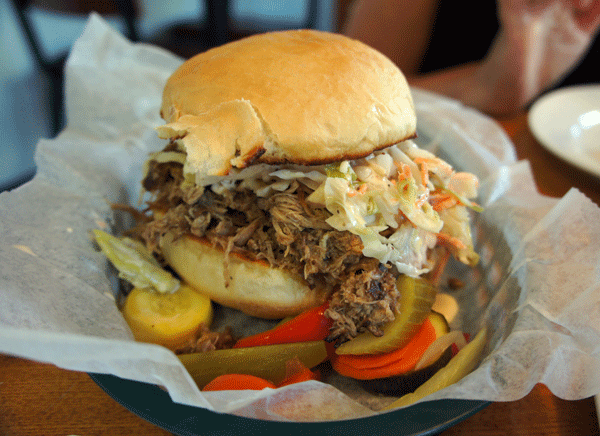 A huge amount of tender meat mixed with vinegary sauce was piled on a toasted bun with not-too-sweet coleslaw. A delicious combination that was nicely offset by freshly pickled vegetables on the side ($8). The BLT was also a great mixture: crisp bacon and bread contrasted with creamy tomato slices and herb-garlic mayo ($7.75). Happily for those more in control of their meat cravings, there are plenty of options, including a fish taco featuring Gloucester haddock and a vegetable and goat cheese panini (Valley View Farm cheese, of course). And that’s without even mentioning the house-cut fries made with Maine potatoes and served with a Great Hill Blue cheese fondue. We’re always happy to see an emphasis on seasonal, local ingredients, and Chef Bill Fogarty obviously walks the walk, offering daily specials based on what’s fresh from the farm or farmer’s market. 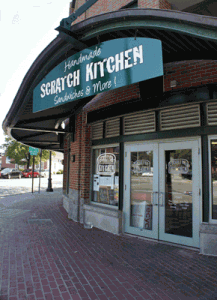 We’re also happy to see that Scratch Kitchen has dinner options like bacon mac and cheese and roasted chicken tossed with pesto and orecchietti, along with wine by the bottle or glass and a strong roster of New England beers.